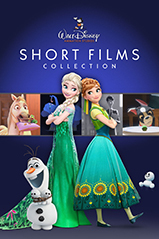 This collection Offer[s] examples of cartoon techniques that go back to the hand-drawn early years of Disney as well as the latest breakthroughs in computer art mixed media, the shorts that help define Disney's success, but not all the shorts from 2000 onward. I thought Paperman was especially lovely. I watched some of this when it came on Netflix. Some of the art is gorgeous, but I have to say the framing of the John Henry story was a little off-putting for me. I'm usually very willing to suspend my political cynic filter when watching Disney stuff, and arguably the John Henry short is just the usual Disney work hard and believe in your dreams stuff, but... I dunno. Even within the blinkered context of the cartoon it doesn't really make any sense that Henry's battle with the steam drill and subsequent death meant anything, because they use the company's willingness to ignore its contract with workers as a plot point earlier in the story. In the context of the cartoon, Henry's death changes nothing about the situation between the workers and the company and yet the company inexplicably decides to honor the contract it had earlier reneged on. The folk ballads about Henry can be interpreted many ways; I'd have been happier with a framing for the story that emphasized either his rebellion against the bosses or his pride in his work. Trying to turn the John Henry story into one about a man sacrificing his life to improve the lives of others might even work, but it fell flat the way they did it here because even in the simple Disney-fied plot it doesn't make any sense. The Little Matchgirl made me sad for the rest of the day. I had not been expecting that. Also, I took a video of my one-year-old daughter giggling hysterically throughout the entirety of "Feast." Apparently she loves animated dogs as much as real dogs. We started watching this and got as far as the intro to Little Match Girl and I was like "NOPE" and my husband was like "What? What's that?" and I was like "You know how Hans Christian Andersen's stories tend to be, shall we say, downers? This one is notorious EVEN FOR HIM" and then we turned it off and did something else. Maybe we'll revisit it later; what's awesome from later in the set? How To Hook Up Your Home Theater is a Goofy one. Tangled Ever After has more Maximus aND Pascal action, and Get a Horse blends old b&w Mickey vs Pete with CGI. My 4 year old was obsessed with this collection when we first picked it up. Even Little Match Girl, which is absolutely worth watching, though it is as sad as you imagine. These are all pretty good, the only one not listed here is Frozen Fever, which is cute but slight. I'm slowly easing into this, but have seen most of the recent shorts. I was also somewhat let down by this, as well. I agree with most of the criticism by Wretch729, it has its highlights, but it struggles to work all together. It definitely doesn't make sense for the company to uphold a verbally based bet/challenge when it doesn't bother with the contract on paper. The animation was at times clever (like Henry working in the darkness, illuminated by his hammer strikes), and also at times, I assume, designed to mimic the style of the 50's and 60's Disney. The music wasn't bad, either, though the story it told was underwhelming. Henry's death has always been Greek Myth-like, achieving something impossible but at an incredible cost. There's another animated telling of John Henry's tale, which apparently goes back to 1973, which I haven't seen in decades, but I recall enjoying it far more than this rendition. One odd aspect that stood out to me was the appearance and disappearance of lines on the characters' faces, as if they were animator lines that weren't cleaned up before the animation was filmed. I don't know if this was an artistic choice or if they simply didn't have the funds to perfectly polish the short. This is a tale lovely in its simplicity. The fuzziness of the animation was really the only thing I'm not a fan of, which I understand was a choice, not a byproduct. It's fun, enjoyable, and I suppose, in the end, kind of forgettable. It's a best picture winner that no one ever goes back to watch again except as part of a compilation. I bought this outright online so I could keep watching it over and over. The design and animation style definitely make it unique and eyecatching. I love the thick charcoal-like lines used on the primary character, creating a sense of a story leaping off the paper. The music is one of the best elements of the short, but the sound design adds an ambiance, such as the train and traffic, that help ground it in reality. I strongly believe the quality of this short made Wreck-it Ralph less enjoyable for me, because the main feature simply wasn't as well put together. As we've seen from a lot of the recent shorts from Disney (and to a degree, Pixar), love is a big topic (see Feast above), and I think one of the successful ingredients of this short are the two protagonists being completely unalike. One has an open mind to the unusual and the other physically fights against it. The minor character animations are great, too, from our protagonist's boss, to the poor glasses wearing fellow who accidentally receives a paper airplane - his instant transformation from delight to irritation was a lovely touch. The design of the office was also fun with all the coworkers kind of mired into the same appearance, suspenders, bow ties and glasses. You get the sense it's only thirty more years until they set off to become corporate raiders. I first saw it in the theater and it really wasn't that exciting in person, in 3D, as it is now on the small screen. There's some visual gags, but it's kind of weighted down by its old fashioned aesthetic, though it's been true to the source material. It felt less like a story (okay, the story is Minnie gets abducted and Mickey needs to rescue her - simple story told repeatedly in the past) and more of an exhibition of animation by the studio. I'm fine with this, I want the animators to literally think outside the box, but as an entertaining short, it falls flat compared to its present day peers. This wasn't mentioned above, but it involves a petulant Persian cat who mocks what turns out to be the feline equivalent of an old gypsy woman (in the horror cinematic sense) for not having a tail, and then as a result, is cursed to have its tail come to life. It's a story with no dialogue, and while to a degree, cleverly animated, the tail just seems too...untail like to really work successfully. I'd consider it something more of a failed attempt than a finished product.